Today we are going to get started using Scratch in order to use this tool with elementary students. While there are plenty of great videos created by the MIT Scratch team at scratch.mit.edu, we are going to go over the basics of using Scratch to draw with the pen tool. Feel free to create an account at scratch.mit.edu or feel free to use mine (I will make the credentials available in the classroom). Before we jump into the activity, first I would like to provide a bit of context. In summary, children should be: working on projects that they are passionate about, working together with peers of varying experience providing constructive feedback, and doing so with a playful approach to testing out ideas and overcoming challenges. The reason I share all this before getting into my lesson is to remind everyone that this is one way to start learning Scratch, but should be learner-centered once the student has the basics. My hope is that that once you make a square and another shape, you start thinking of how to make something that interests you. After trying the Start here challenge for a few minutes, we are going to have you work with a partner on the LessonHandout sheet that was passed out in class. You will also need a turtle (green triangle with a hole for a pen). As a team try to make the turtle follow the script on the handout by moving it around on the stage. Next, you will translate the script into your own words. You have all the supplies to make this light sensitive heart. Please feel free to share any suggestions in the comments below. 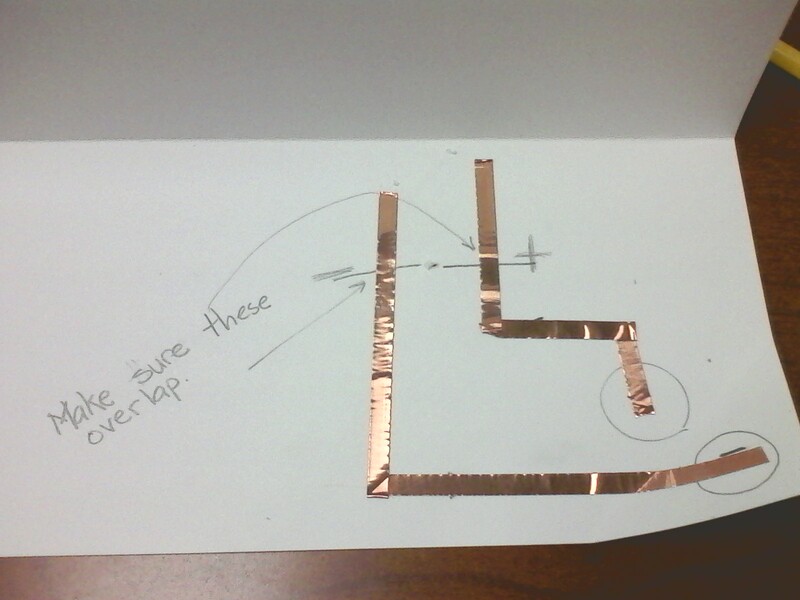 Yesterday we explored parallel and series circuits with copper tape, through-hole LEDs, CR2032 button batteries, and card stock. Today we will revisit these circuits using conductive and non conductive dough. Before hooking up your squishy circuit, watch the following video. Let’s see what happens when we try to make a series and parallel squishy circuit. 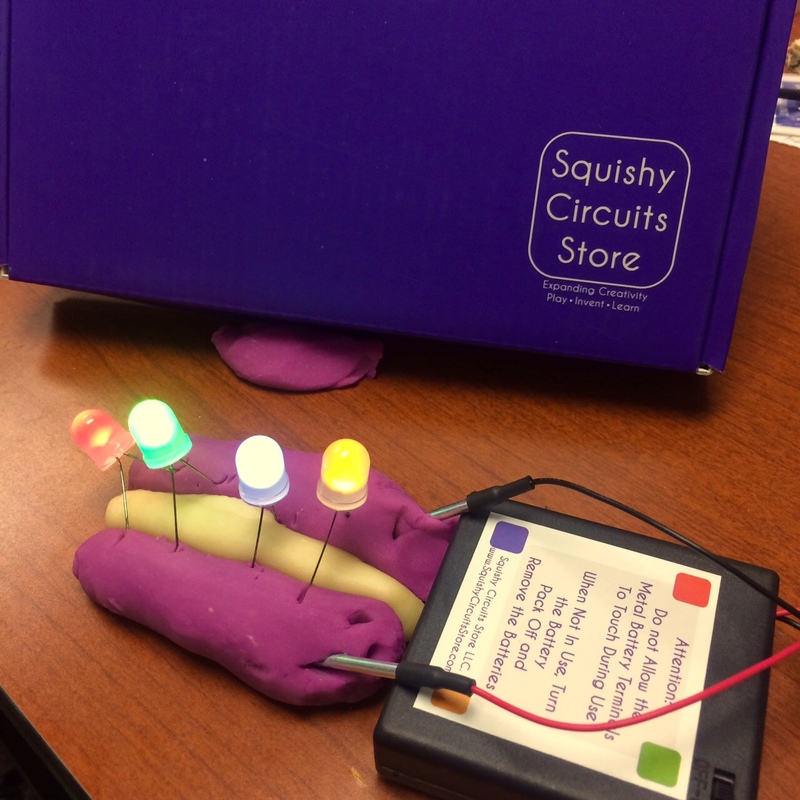 How might you be able to integrate a squishy circuit into a lesson you already teach? Next we will begin to create some e-textiles. You may say, “what is an e-textile?” An e-textile in our case will mean using conductive thread(stainless steel fibers) to sew LEDs, buzzers, and microchips into a piece of fabric. Lets start with a very simple circuit. 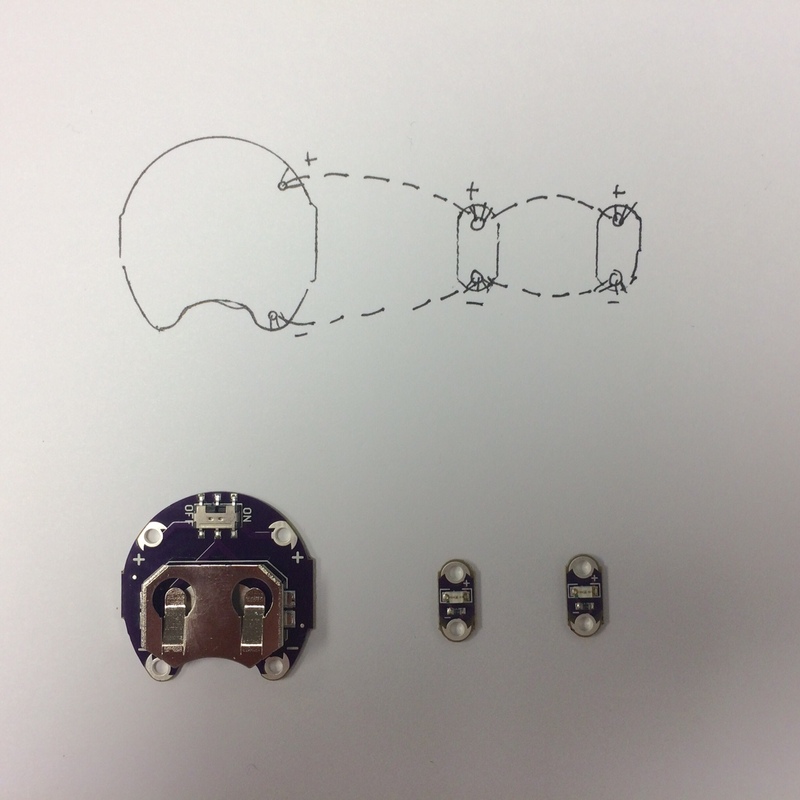 We will wire two red Lilypad LEDs in parallel to a Lilypad battery holder with an on-off switch. First you should always sketch out your circuit. 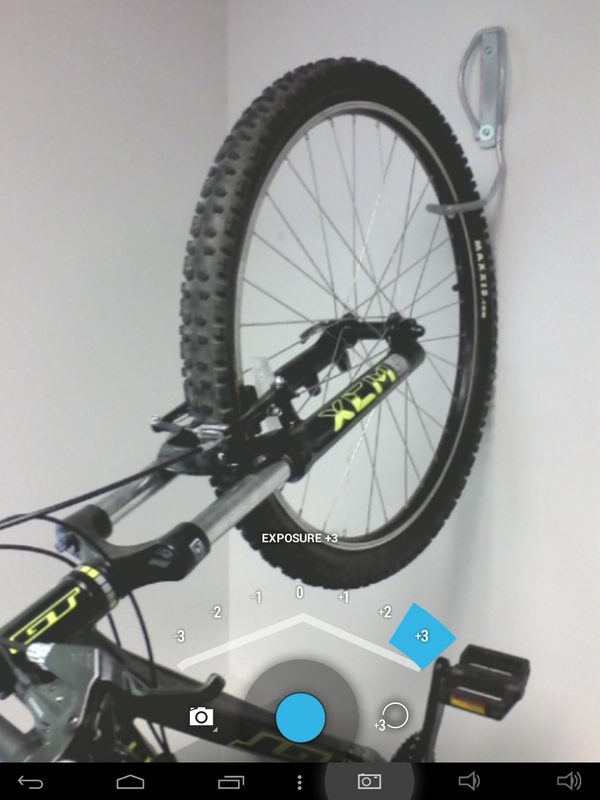 I like to trace the components to help me see how everything will line up. Matt has created a video for tutorial on threading a needle. He can also show you in person. When starting a stitch I put a double-knot at the end of my thread and fold the thread over the needle so it overlaps about 4-5 inches. It is best to keep your stitches short (1/8″) to maintain conductivity. In the circuit drawn above I will start my stitch on the back of the positive end of the LED on the right and stitch around the tab 4 times before stitching towards the next led. You will want to use one piece of thread to continuously stitch the entire positive line from led, to led, to battery, and then tie off. You will use a drop of clear nail-polish to secure the knot. Repeat this procedure for the negative(ground) line. Insert your battery and test your circuit. This first e-textile was mainly to practice stitching. Welcome to the STEM-U Sewing Up Science Workshop. This blog will provide a tentative outline of the activities you will be working on throughout the week. I have created this blog on WordPress. I would like you all to create a blog of your own to create a lasting artifact that you will be able to refer back to during the busy school year. My entries will also continue to be available for your reference. Last spring I taught a full semester course called Craft Technologies in the Instructional Technologies and Learning Sciences department. I have been living in Logan for a year now. Before starting my doctoral studies, I was an elementary science teacher in Brooklyn for 8 years. Today we are going to be working with paper circuits and squishy circuits. In addition, we will be getting everyone up and running with WordPress on your new tablets. You will notice that these devices might be a little slow, but as teachers we all know how to make the best of the materials we are provided. 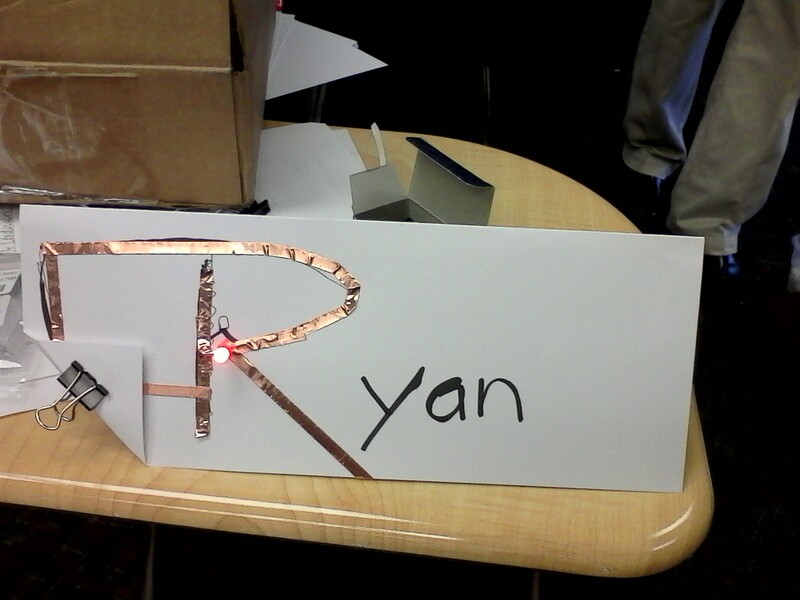 I have created a blog entry with my NuVision tablet on how to make our first project of the day, which is a paper circuit enhanced name tag. 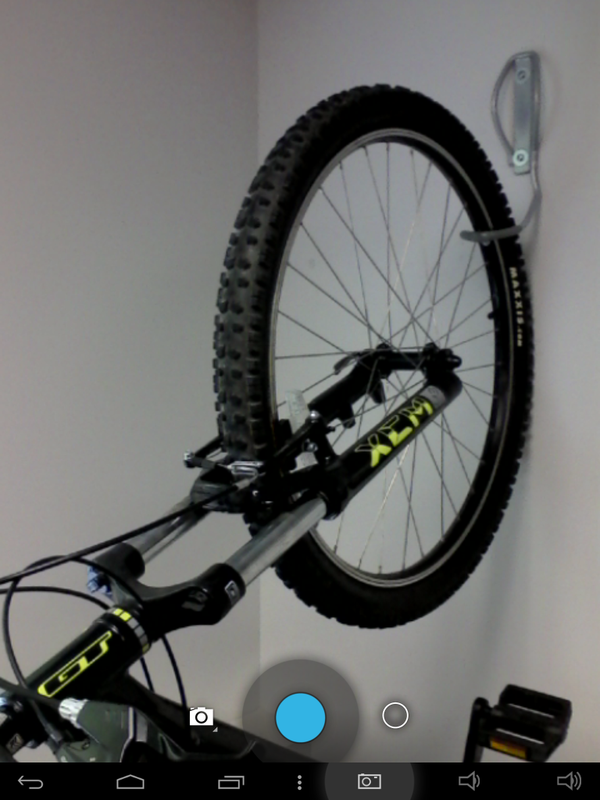 I have found that it is best to have the camera over expose for the light for nicer looking images, below is an example. These are screen shots to show how to access the exposure control. Touch the circle to the right of the blue dot. Then click the +/- icon (not pictured) and then click +3 or +2. This work is supported by the Center for The School of the Future at Utah State University, http://csf.usu.edu/, and Idaho National Labs, https://inl.gov. 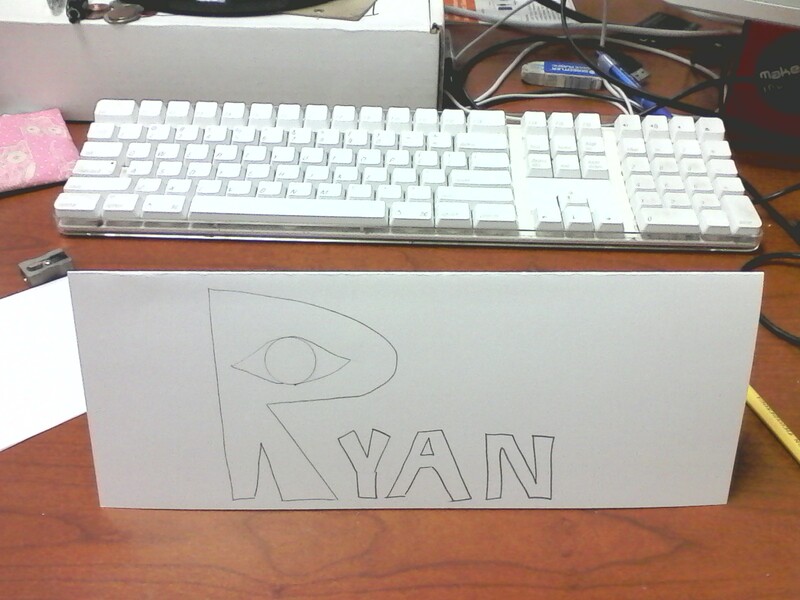 This page documents the creation of my LED enhanced name tag table tent. 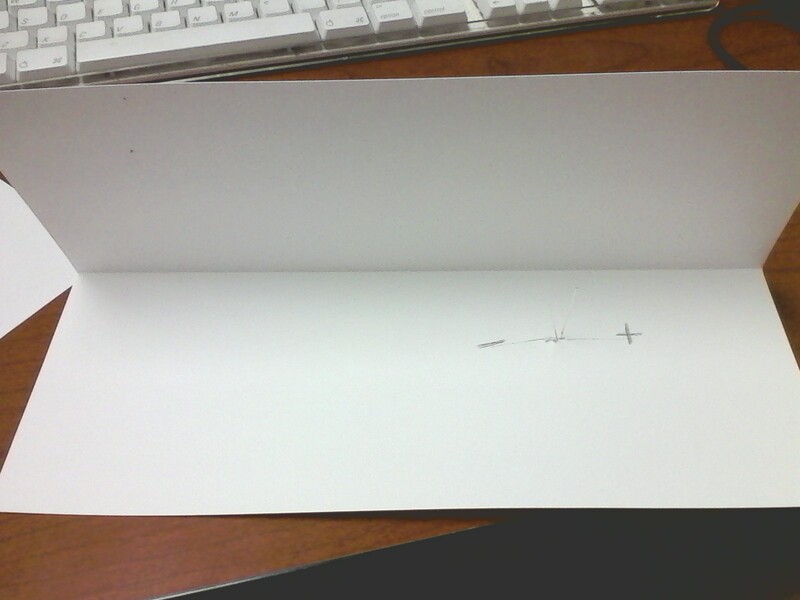 First I sketched my name in pencil leaving at least two inches of space on each side to leave room for a battery. 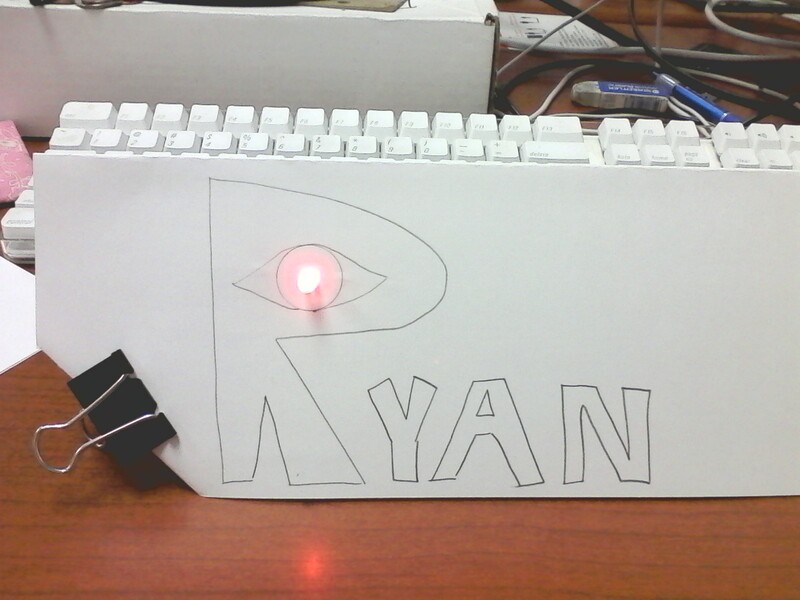 My idea is to place a red LED in the pupil of the eye in the letter R. I have decided to hide the copper tape circuit on the back of the paper. 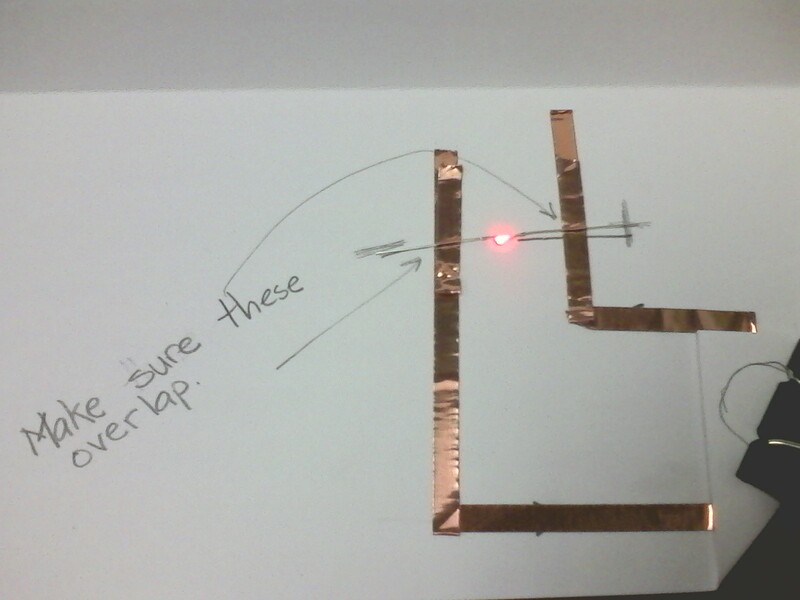 I first poked the LED legs through the paper to see where my copper lines will connect noting the cathode(-) anode(+) legs. 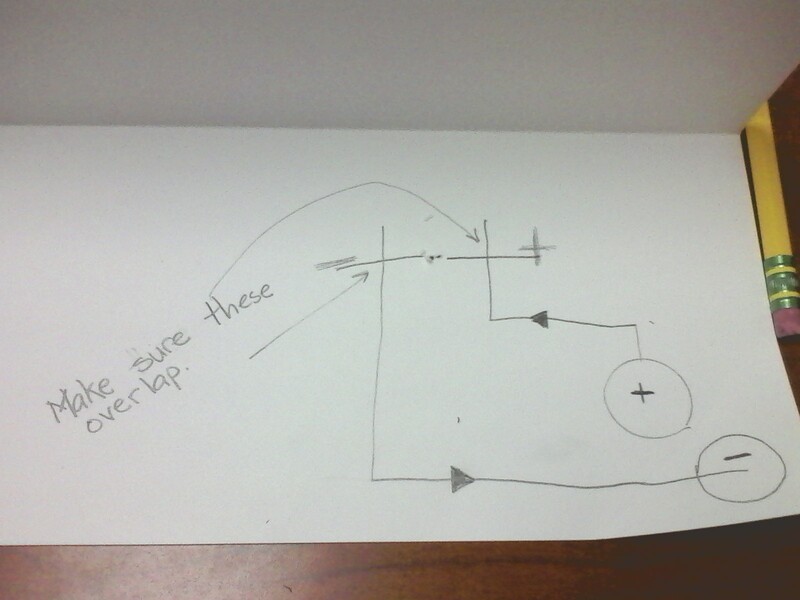 Next I sketched out my circuit noting the direction of current flow and placing a fold pocket for the battery. Next I run my copper lines with a continuous piece of copper from each terminal of the battery to the line for the LED. N.B. I do not have the LED through the paper at this point. Finally I insert the LED and use copper tape to secure it to the circuit.